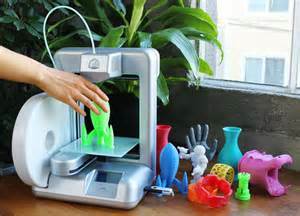 3D printing is not new – stereolithography, or solid imaging was invented and patented around 1987 by Chuck Hull; He then founded 3D Systems and is the company’s chief technology officer. Many advances have been made since, from materials used to printer sizes and capabilities, and the technology is becoming more mainstream. Aside from business applications, consumers and hobbyists can also invest in the software and printers (or upload their digital files to third-party services) and bring their interests to life in a whole new way. 3D printing “called €additive manufacturing” by industrial users is rendered from a digital model created with computer-assisted design (CAD) or animation modeling software. The file (a cross-sectioned image) is uploaded to the printer, which transforms the virtual blueprint into the object. Layer by layer, the printer builds the object by passing over a platform where the material is transferred (sprayed, squeezed or by other conveyance) in thin sheets; it is then fused together to make the final product. The materials used are rubber, plastics, paper, metals, and polyurethane-like materials. Barring the expense of the 3D printers (more on those later), companies can use this technology for rapid prototyping, creating models and product prototypes in a few days as opposed to outsourcing the work and waiting a few weeks. Traditional supply chains and production methods will eventually be transformed, at least for certain industries, as mold making and other production tooling is undertaken on site by the manufacturers and designers. By circumventing the old prototype process, users have greater control over their projects. According to Bloomberg Businessweek, aerospace and automotive industries have been using 3D printing for at least 25 years. In fact, as reported in PC World in October 2013, Boeing is making small parts for some of its planes via additive manufacturing, such as air duct components and wiring covers, and also uses the technology with metal to produce prototype parts for a variety of tests. Boeing hopes to scale up its processes in order to build larger, structural components for military and commercial aircraft. As equipment gets bigger to handle large titanium structures, there’s no telling where this technology will lead. NASA’s Jet Propulsion Laboratory has been using additive manufacturing to test new concept parts for spacecrafts. Prosthetic devices, casts and braces. If this is not in your budget, there are affordable third-party online 3D printing services simply upload your file and specifications and your item will be rendered and shipped to you. There is even an open source 3D printing community (Fab@Home) that will handle your project. Are you using 3D printing for your business? If so, let us hear about what you are creating and how at IND Corp. If you’re thinking about introducing 3D printing, let’s discuss your options. Looking to enhance your company’s on-premise or cloud technology in 2015? That’s where IND Corporation comes in. Contact us for a consultation about your computing network, hardware and software or ask about our flat-rate managed IT services. Author: Eric Speidel is the co-founder of IND Corporation, who specializes in IT support and consulting services for New Jersey businesses since 1990. For more questions, feel free to contact us at 973-227-5020 or visit us at IND Corp.
Graphene: Revolutionary Material or a Pipe Dream?